I know that December 23rd is supposed to be all about tying up all those hundreds of Christmas loose ends, but today my thoughts are gravitating towards 2013. The year will begin with my 45th birthday, which seems unimaginably bizarre, as that number sounds so unimaginably middle-aged. I want to start thinking of a cool new year’s resolution. 2012’s resolution was to save all found money and then count it up at the end of the year. My goal had been to find $65, enough to pay for a night at the Oregon coast. (I think the amount will be closer to $25, so I’ll let you know next week.) 2011 had been to mail out 52 letters, which was fun, although I kind of lost momentum mid year. I know my resolutions trend more towards fun projects than self improvement, but that’s okay. One thing I know for sure is that 2013 brings new opportunities and new challenges. My older son will start his senior year of high school in 2013, and I know fresh writing and blogging opportunities will come my way. Hopefully, those writing gigs will pay, (I’m looking at you, Huffington Post and Katie Couric!) as I want to start monetizing the blog better. My nephew will have his Bar Mitzvah in the fall, which will necessitate a trip to New York City. I plan on setting up some writing related meetings in conjunction with the visit. But for today, I need to walk down to the nearby shopping boulevard and finish up my shopping. And because it’s Oregon, I’ll be wearing a raincoat and winter boots. I am making some small mini goals or challenges for myself through out 2013 rather than one life changing resolution. First up is a goal to have our emergency fully funded by February. I follow Dave Ramsey’s financial plan, so 3-6 months of expenses is needed. I’ve already started saving, but to have it fully funded by February will still be a challenge. From there I will come up with some other mini goal or challenge to keep me motivated throughout the year!! I have two small interior home projects: clear the floor in the guest room, and do a written and pictoral home inventory. These projects are in the order written; I don’t want to inventory that room in its current state. And Katy, be glad you have the moisture. West Texas, where I live, has had two dust storms in the past five days. First one, last Wednesday, caused a 22-car pile-up on Interstate 27 near here. Visibility was near zero. One person was killed when their car went under an 18-wheeler truck. I am thinking ahead as well….my job of the past 6 years will end in early 2o13 which means I will enter my creative retirement years, trying to figure out ways to bring in income while working at home. A move will be in my future as well. And since I don’t adjust well to change, all this will be both exciting and unnerving. I am also getting my plan together for 2013. But, as usual, it’s a continuation of what’s happening now. I always seem to start more projects in the Fall and they tend to carry me through the following year. As for 45, I think we are redefining what it means to be a woman in her 40’s all the time. I’ll be 45 this summer and I’ve stopped attaching any significance to my age. Whatever age you are, it’s the youngest you’ll ever be. Enjoy! I also truly feel that having the privilege to age in good health is a gift. I just don’t feel 45 . . .
Have a wonderful Christmas! I’ve enjoyed reading your blog–so glad we’ve crossed paths! It’s 20 degrees outside and I still haven’t turned on the heat. I’m eager to see how far into the new year I can go. I am looking forward to Russell Stover candy marked down to 2 bucks a box the day after Christmas…will I go see Le Mis or blow my 10 bucks on candy for the year??? Other than that, I am planning more meatless meals in 2013…cheaper and lower on the food chain. The book “Full Planet, Empty plates” keeps reminding me it takes 7 lbs of grain for each pound of beef and the extra water to grow it. Previous post: Is it Okay to Give Used Gifts? 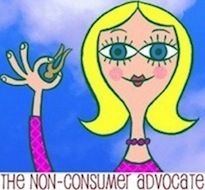 Next post: Merry Christmas From The Non-Consumer Advocate!